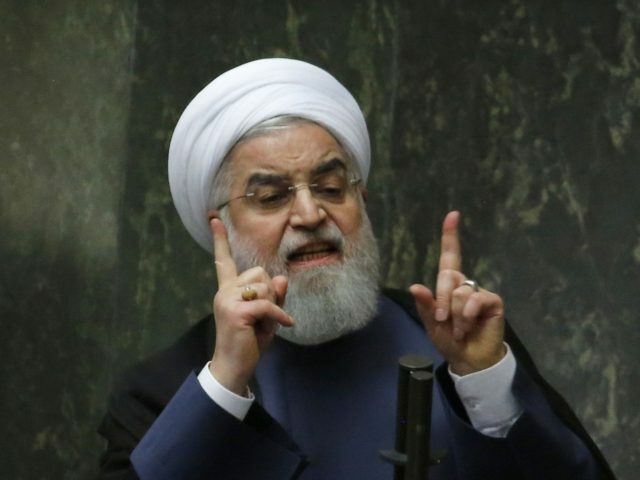 President Hassan Rouhani’s remarks were designed to deflect criticism of his administration’s dismal performance amid a spiraling economy after President Donald Trump last year ended the Obama-era nuclear deal and re-imposed sanctions on Tehran, targeting Iran’s vital oil sector. Rouhani previously said his country faces the worst economic crisis in 40 years, entirely due to U.S. policy, as Breitbart News reported. Citizens are demanding answers on unemployment, rising prices and the collapsing value of the rial, which has lost more than half its value since April. “Put all your curses on those who created the current situation,” Rouhani urged Iranians Monday, adding that “the United States, the Zionists” and Saudi Arabia were to blame for the country’s ills. He didn’t say what kind of curses the Iranians should invoke. On Sunday, the same day he inaugurated a new phase in the development of a massive natural gas field, Rouhani confirmed Iran’s inflation is “above 20 percent” and that this country of 80 million people has more than 3 million unemployed.